Figure 1. 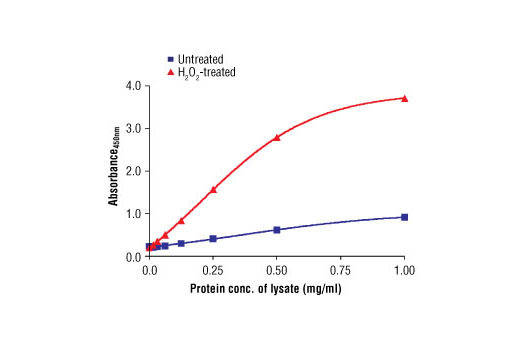 The relationship between the protein concentration of lysates from untreated and H2O2-treated C2C12 cells and the absorbance at 450 nm using the PathScan® Phospho-AMPKα (Thr172) Sandwich ELISA Antibody Pair #7955 is shown. Rinse microplate with 200 μl of dH2O, discard liquid. Blot on paper towel to make sure wells are dry. Dilute capture antibody 1:100 in 1X PBS. For a single 96 well plate, add 100 μl of capture antibody stock to 9.9 ml 1X PBS. Mix well and add 100 μl/well. Cover plate and incubate overnight at 4°C (17–20 hr). Wash four times with wash buffer, 200 μl each time per well. For each wash, strike plates on fresh paper towels hard enough to remove the residual solution in each well, but do not allow wells to completely dry at any time. Block plates. Add 150 μl of blocking buffer/well, cover plate, and incubate at 37°C for 2 hr. Lysates can be used undiluted or diluted in blocking buffer. 100 μl of lysate is added per well. Cover plate and incubate at 37°C for 2 hr. Dilute detection antibody 1:100 in blocking buffer. For a single 96 well plate, add 100 μl of detection antibody Stock to 9.9 ml of blocking buffer. Mix well and add 100 μl/well. Cover plate and incubate at 37°C for 1 hr. Secondary antibody, either streptavidin anti-mouse or anti-rabbit-HRP, is diluted 1:1000 in blocking buffer. For a single 96 well plate, add 10 μl of secondary antibody stock to 9.99 ml of blocking buffer. Mix well and add 100 μl/well. Cover and incubate at 37°C for 30 min. Add 100 μl of TMB substrate per well. Cover and incubate at 37°C for 10 min. Add 100 μl of STOP solution per well. Shake gently for a few seconds. CST's PathScan® Phospho-AMPKα (Thr172) Sandwich ELISA Antibody Pair is offered as an economical alternative to our PathScan® Phospho-AMPKα-(Thr172) Sandwich ELISA Kit #7959. Capture and Detection antibodies (100X stocks) and Anti-Mouse IgG, HRP-linked Antibody (1000X stock) are supplied. Sufficient reagents are provided for 4 x 96 well ELISAs. The AMPKα Rabbit Capture Antibody is coated in PBS overnight in a 96 well microplate. After blocking, cell lysates are added followed by a Phospho-AMPKα (Thr172) Mouse Detection Antibody and Anti-Mouse IgG, HRP-linked Antibody. HRP substrate, TMB, is added for color development. The magnitude of the absorbance for this developed color is proportional to the quantity of Phospho-AMPKα (Thr172) protein.